A collection of 5 beautiful bonnets. The Lacy Peek-a-Boo is a T-shape that ties together w/ribbon. The Hankie Bonnet is designed for baby to wear & then later when he/she marries, it can be made back into a hankie to be carries by the bride. Antique Christening Bonnet is fashioned after a bonnet made in the 1920's. 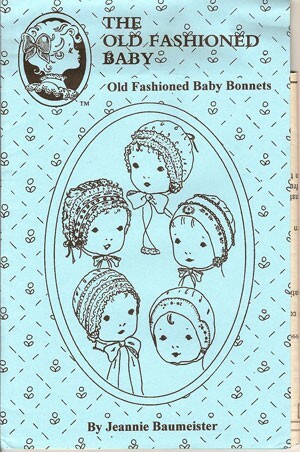 The Little French Bonnet is a quick & easy version of an old favorite. The Little Scalloped Cap is perfect for a little boy having a chin strap & is lined. Embroidery patterns included.